← The Timberwolves: Are they really the worst? So, Oladipo: Good or No Good? 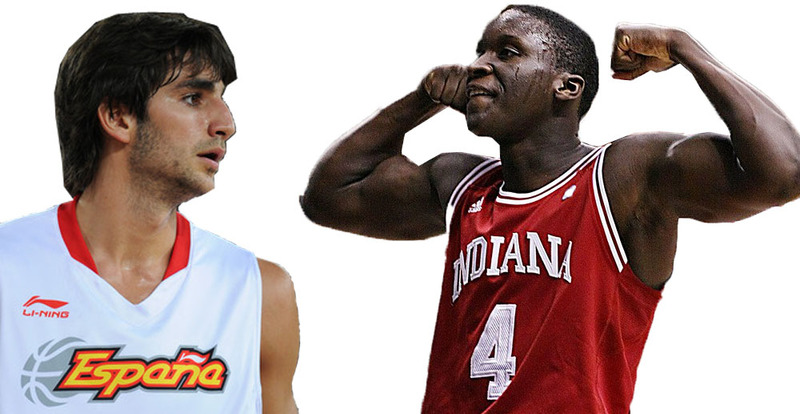 Andy G: Yes, Wolfson writes that Saunders is a big fan of Indiana guard, Victor Oladipo. This is the presumed motivation for seeking trade-up opportunities. Can he play? On defense, the answer is yes. There’s basically no doubt that Oladipo will be a plus NBA defender. Given his freakish side-to-side athleticism and bounce, Victor might even become a disruptive defender in the mold of Avery Bradley and Jrue Holiday. Paired alongside Ricky Rubio — an excellent and versatile point-guard defender — Oladipo could make the Timberwolves a good-to-great defensive team. They were 13th in the league last year in points allowed per possession, and that was without a healthy Ricky Rubio for much of the way and with point guards Luke Ridnour and J.J. Barea taking much of the off-guard minutes. So yeah, put in a healthy Ricky and Victor Oladipo, and it would seem to follow that the Wolves would become a Top-10 NBA defense. But there is another side of the ball, too. And while opinions differ on the relative importance of offense and defense, there’s no question that Ricky Rubio’s style of play is most effective when the point guard passes and everyone else shoots. The Wolves were dead-last in three-point shooting accuracy, by an alarming margin. So in order for Victor to help the Wolves offense (ranked 25th last year) he’ll need to make jump shots — preferably the ones worth three points. Can he shoot? Well, last year Victor made 44.1 percent of threes. Great, right? Not so fast. He only took 1.9 of them per game. In other words, when he was wide open. The season before that he shot a miserable 20.8 percent from the college three-point line. The season before that he shot 30.8 percent on just 0.8 attempts per game. His shooting is a question mark and if he clanks open jumpers set up by Ricky Rubio dishes the same way Corey Brewer would on [rare] kick-out passes from Al Jefferson, it just won’t work. Finally, and perhaps a tie-breaker of sorts between the bona fide defensive chops and the offensive uncertainty, there is the transition game. The Wolves do not get out in transition as much as a Rubio-led team should. They were 19th in the league in fast break points per game, and closer to the bottom (Knicks) than the top (Nuggets). Oladipo’s crazy speed and defensive aggressiveness should help create more open-court sets and — in turn — create more easy baskets. If we’re lucky, he’ll even throw down some 360’s like the one in that video. Oladipo is probably the most intriguing prospect in college basketball. At the start of the year, very few people outside the state of Indiana thought much of his NBA draft stock. Last season he showed that he was a great athlete who could attack the rim, play pretty strong defense, and make the occasional jaw-dropping play. But his game was way too unrefined for anyone to take him seriously as a legitimate first-round pick. He gambled on defense too much, he didn’t really have a jump shot, and he was a shaky ball handler. Somehow, he fixed pretty much every flaw in his game during the offseason,2 and by the time Christmas rolled around, Oladipo had wedged himself into the national player of the year discussion. A month later, some were wondering if he would be the first overall pick in the draft. Since then, he’s cooled off a bit and will likely get drafted in the 7-to-10 range, but it’s still remarkable to think that he’s a lottery lock when a season ago his chances at an NBA career seemed nonexistent. The biggest thing standing in Oladipo’s way right now and the one thing that could keep you from being impressed as you watch Indiana play in the tournament is Hoosiers coach Tom Crean. All season long, Crean has defied logic with his substitution patterns, and he has left Oladipo on the bench during crucial stretches of games. In the same way that Ben Howland doesn’t seem to appreciate what he has with Shabazz Muhammad, Crean apparently doesn’t realize how good Oladipo has gotten since last year, as evidenced by the fact that Oladipo is averaging only 1.4 more minutes and 0.5 more shot attempts per game than he did a season ago. Despite being underused on offense, however, Oladipo still plays some of the best defense in the country and has a knack for making huge plays on both ends of the court, which is why he’ll definitely be drafted in the lottery. The most drastic improvement from last season is his shooting, as his overall field goal shooting has improved by 13 percentage points and his 3-point shooting has improved by 24 percentage points. Some chalk this up to hard work in the offseason, while others point to the fact that he usually only takes wide-open shots. Trying to determine which of these scenarios is closer to the truth is what makes him so intriguing. And, finally, the DX Scouting Video. Note the shooting clips at the 9-minute mark. His form looks very good — nice balance, elevation and sequencing — which is a telling sign that perhaps his improved percentages are not UNSUSTAINABLE! (necessary double negative). Patrick J: There were several stories of local interest that came out of the combine and other recent scouting exercises. They focused mainly on former Gophers Trevor Mbakwe and Rodney Williams, and Minnesotan Nate Wolters of South Dakota State University. Reports out of the combine are that Trevor Mbakwe wowed scouts with his measurements and athletic ability (summary here). The main questions now are his age, injury history, off-the-court issues, and offensive skills. Will Mbakwe get drafted? That’s the big question. He’s currently projected as a late second-rounder – #50 – by DX. For me – and a lot of other Gophers fans – Rodney Williams is a symbol of squandered talent. “Pure talent, fatal flaw,” is the apropos quote from Above the Rim. Williams wasn’t even INVITED to the combine at which Mbakwe’s physical characteristics wowed scouts. But Williams is perhaps equally if not more physically impressive than Mbakwe. Williams has measured out at a standing vertical of 36’’ and a max vertical of 42.5’’ – which would’ve been good for second best – if he’d been invited to the combine. Williams is a fringe NBA player and I doubt he’ll make it. He never developed the ball handling skills or the jumper to match his All-World Athleticism, and he’s light-years behind similarly athletic prospects from past years like DeMar DeRozen and Terrance Ross. He’s probably going to suffer a fate more similar to that of Stud Athlete Joe Alexander, but without the lofty rookie kahntract. (For more on Alexander’s long, strange trip, see this story.) I wanna see Williams make it, but I don’t see the universe agreeing. SDSU’s Nate Wolters raised eyebrows during the regular season, and played well enough at the combine to retain his position as a late first-round or second-round pick, despite missing the second day with an injury to his arthritic hip condition*. Wolters has officially emerged as a prime sleeper candidate in this year’s draft, and might be a very nice “buy-low” replacement for J.J. Barea’s kahntract, which has two years remaining on it at over 9 million dollars. *He Got Game joke here, Wolters — to my knowledge — does not actually have an arthritic hip condition. He seems likely to go in the 2nd round and could be a serious sleeper. Might not be a great fit for the wolves, but seems like he might turn into a potentially solid backup. Beyond that, a good summation of where things stand. I would be really happy if the wolves traded up for Oladipo (unless they have to take back Tyrus Thomas’s terrible, terrible contract). I haven’t seen enough of Muscala – apart from his gaudy stats, which are definitely intriguing – to have a solid take on him. The few videos I’ve seen make me think his body/lack of athleticism mean that his ceiling is as a solid backup. Nothing wrong with that – on the contrary, it can be very valuable – but is there anything I’m missing to suggest he could fill a larger, more instrumental role on a team looking to be in the playoffs the next few years?